Property taxes are due on Feb. 22, 2019 (for the 1st half of the year). Tax bills should be in the mail by the end of Jan. 2019. Anyone who does not receive a bill by Feb. 1 and should have one: please call the Treasurer's office at 740-474-2370. Manufactured homes: taxes are due on Feb. 22, 2019. Taxes for the 2nd half of the year will be due July 19, 2019. Taxes may be paid with MasterCard or Visa, either in person or by phone; Visa, Mastercard, Amex & Discover are accepted via our website. Treasurer's office hours are: M-F 8AM-4PM. As required by law, any payment made within 10 days after the due date is subject to a 5% late penalty and any payment made 10 days or more after the due date will have a 10% late penalty. These penalties apply to real estate, manufactured homes and personal property taxes. Please feel free to call our office with any questions. Thank you for allowing me to serve you. County Treasurer Ellery Elick completed the 5th tax-lien sale for Pickaway County in Dec. 2017, which netted $79,499.73 in delinquent real estate tax revenue. This translates into additional tax dollars for the townships, villages, city and county. Treasurer Elick stated that "through the use of tax-lien sales, the overall delinquency rate has significantly decreased. Tax-lien sales are another tool that we use to increase revenue and decrease the number of parcels carrying delinquent balances." Ellery Elick was elected to the position of President of the County Treasurers Association of Ohio at the Nov. 2017 conference. He previously served as secretary, treasurer and 1st vice president. He has also served on the Legislative Committee since 2004, and several times has been a part of the conference planning committee. "Our State Association is a great organization in which treasurers from all over the state of Ohio can share information and ideas to better serve our counties," he said. Ellery Elick is sworn in for his 4th term as county treasurer in 2017. 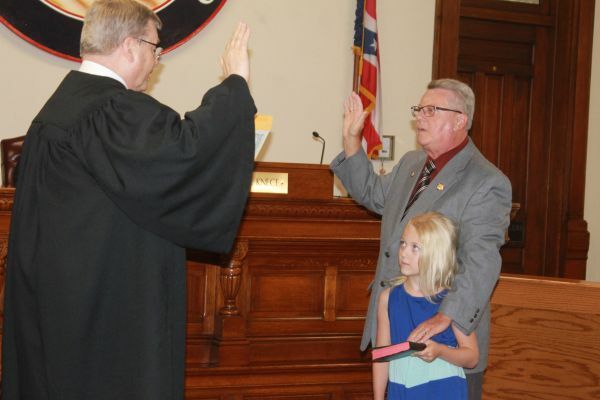 Nearly nine months after being re-elected in the November 2016 general election, Pickaway County Treasurer Ellery Elick took the oath of office on Wednesday, Aug. 4 2017 before a packed common-pleas courtroom of family, friends and fellow elected officials. Retired judge Steven B Hayes administered the oath to Elick, while his grand-daughter Clayre held a Bible given to Ellery by his parents in 1960. This is his 4th term of office, which began when he was appointed in May 2003, to fill out an un-expired term. Following the swearing-in, Elick spoke to those in attendance about the ethical standards that go along with his job as treasurer. "Today, I took my oath of office and pledged to you that I will continue serving you with the trust and integrity you require of me each and every day. Because when one loses those traits, then his character is in jeopardy. One of the organizations to which I belong is Rotary, a service-based club founded on four basic principles: truth, goodwill, friendship, and fairness. I sincerely hope that I have lived up to those guidelines and continue to do so as your county treasurer over the next four years and beyond. I ask that you pray for all our elected officials that we can be all that is expected of us each and every day." Elick now becomes the third-longest-serving treasurer for Pickaway County. Judge Randall P. Kneece also administered the oath of office to four deputy treasurers: Stella Kuhn, Angela Karr, Robin Tackett and Susan Zilli. The county treasurer has multiple roles which combine into one main function--that being the chief financial officer for the county's funds. Those funds are derived from several sources. As the chief tax collector, the treasurer oversees all forms of levied taxes including real estate property, manufactured homes, personal property (both tangible and intangible*), inheritance (estate) tax, and the collection of taxes from vendors and cigarette licenses. In addition, all monies from other various county departments are paid into the treasurer's office for distribution by the county auditor. The treasurer is responsible for making sure all monies are balanced daily and deposited in a timely manner. As the chief investment officer for the county, the treasurer has the responsibility to invest all monies in sound, safe and quality investments to maximize earnings, and to also record and distribute interest received accordingly. The treasurer serves on several county boards, including: Board Of Revision, Budget Commission, Data Processing Board, and other committees as requested. *Intangible-property tax was the business tax collected on inventory, sales, etc. ; this is no longer being collected because it has been phased out by the state legislature.